If you are a follower of anniversary etiquette, you probably know there are traditional gift idea for every year you celebrate of marriage. And while some years gift ideas are obvious (gold, ruby, pearls and flowers) other years it may be more difficult to find the perfect gift. A fifth anniversary is one of those occasions. While silverware is suggested as the modern annual gift, I personally don't think that is the most romantic gift idea, and not very meaningful. 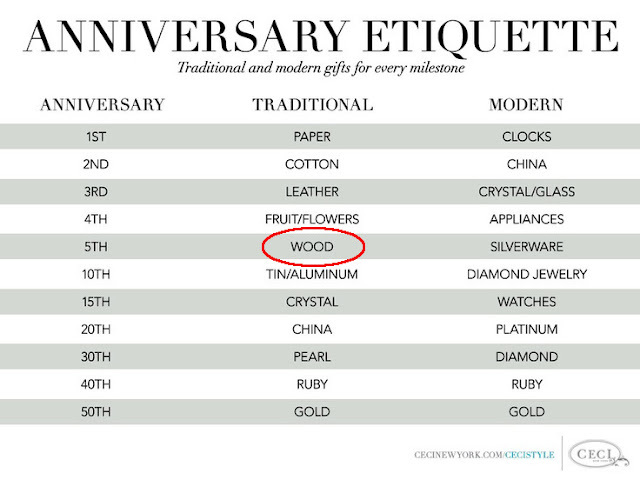 On the other hand, the traditional 5th year anniversary gift suggestion is "wood" which allows for much more creative and personal gift ideas. You can’t get a gift idea much more traditional then an anniversary band, but having one made of wood and titanium personalizes it. I personally own the Sandalwood version (pictured above) and it is a beautiful watch. It is a statement piece and I love telling people about it. These gorgeous timepieces are made of real wood plus they have styles for both women and men which means they would make great anniversary gifts. Aren’t the initials carved into the tree just the cutest thing? It would be a fun way to save bottles of wine to drink on your anniversary every year. A great way to be reminded of your fifth anniversary, every time you chill the wine! This is such a fun option. With your names and anniversary date. Remember: the couple that plays together, stays together! If you are taking a romantic vacation for your 5th anniversary, these would be a great way to commemorate the occassion. I saw this map on Snapchat a while ago and I loved it. Collecting a bottle cap from every state. Or you could save one every year. What a fun way to keep a collection. A wooden flashlight is one of the most unique gifts I’ve come across. If your spouse is the outdoorsy type this would be a fun surprise. And finally, a traditional wooden bowl would be a lovely gift for any married couple. A couple's fifth anniversary is a special and personal time. Commemorate it with the traditional gift of wood, with these meaningful and personal gift ideas! All opinions and ideas are my own.